Don’t look now, but Australia is setting itself up to ride the wave to a tidal-powered clean energy future. In a nation long known as one of the coal capitals of the world, the ocean’s potential to provide electricity without emissions gets clearer every day. 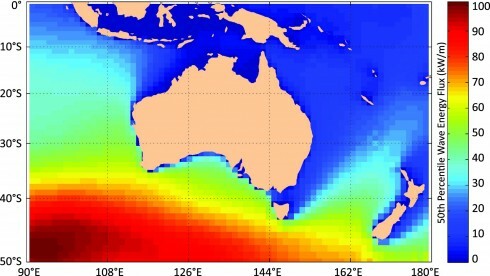 A new report from the Commonwealth Scientific and Industrial Research Organization (CSIRO), the national scientific research entity, found the motion of the ocean could supply about 11 percent of Australia’s electricity by 2050. This power could be generated across as little as 150 kilometers of coastline, depending on the installed technology, and could be reliably forecast three days in advance. The finding is a big deal for a nation where 80 percent of the population lives along the coast, and is equivalent to powering Melbourne, Australia’s second-largest city. Wave-power potential is greatest along the country’s southern coastline, driven by strong winds that generate consistently large waves, but it is also notable near Australia’s eastern coast, alongside its main population centers. The study mainly cited tidal energy, but also examined the niche potential of ocean thermal power to supply local power needs along the northern Queensland coast. While ocean energy’s potential is massive and ought to be explored, the study also found significant hurdles in the way. Researchers note that ocean currents can move over time, meaning infrastructure built in one area may not always be ideal. In addition, the ocean energy industry is still working to build generator blades large and strong enough to withstand constant use and corrosive conditions. Environmental, economic, and cultural considerations could also prove prohibitive, including impacts to marine protected areas, indigenous land rights, shipping lanes, defense, and recreation. The report also notes wave energy’s future hinges on the success of Australia’s carbon tax, which began operation this year but has been threatened with repeal by the country’s opposition political party. Even with these unknown factors looming large, the island nation is rising with the tide toward realizing its renewable energy potential. 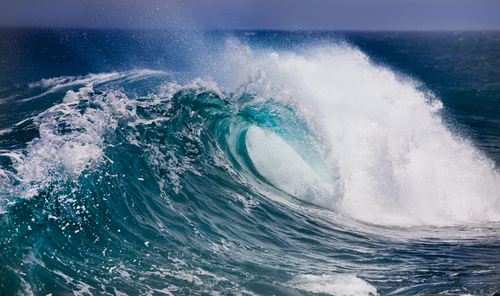 Australia recently committed $10 million to help bring two new wave energy systems to market, including the world’s biggest wave energy turbine, a 250-kilowatt (kW) full-scale pilot plant. The world’s largest wave energy project, a 19-megawatt installation, is also expected to begin construction in 2013 off the southeastern state of Victoria. The joint public-private effort between Lockheed-Martin, Ocean Power Technologies, and the Australian government should start generating electricity in 2014 and be fully online by 2017. Australia’s navy is also moving full-steam toward wave power. HMAS Stirling, the largest naval installation in the country, recently signed a power supply deal to secure electricity from an installation of submerged buoys off the western coast of Perth. Like most renewable energy technologies, wave power is expected to become more affordable and cost-competitive as additional testing is completed and more projects come online. One recent estimate found wave energy will drop to $100 per megawatt-hour (MWh) by 2020 – a price on par with offshore wind. Wave energy is still in its nascent stages, but CSIRO’s report means it could soon grow to a tidal wave in Australia’s clean energy future. “Assessing the opportunities and challenges from resource to the market is a first for ocean renewable energy,” said Ian Cresswell, the report’s director.